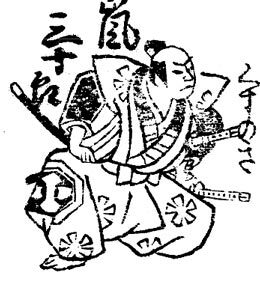 The actor Yagi Niemon held the name of Arashi Sanjûrô I from 1695 to the 10th lunar month of 1727. 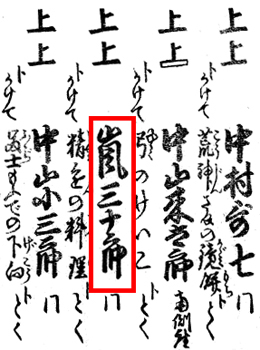 The actor Arashi Sanjûrô II held this name from the 11th lunar month of 1727 to the 5th lunar month of 1750. 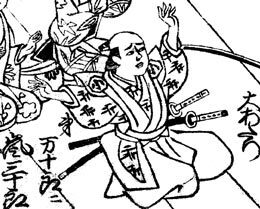 The actor Sanogawa Hanazuma III held the name of Arashi Sanjûrô III from the 11th lunar month of 1762 to the 10th lunar month of 1763. 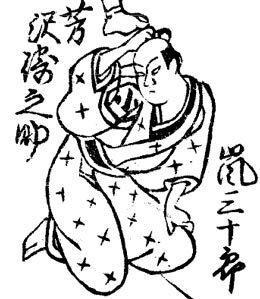 The actor Seki San'emon held the name of Arashi Sanjûrô IV from the 11th lunar month of 1772 to the 10th lunar month of 1786. The actor Arashi Shinpei IV held the name of Arashi Sanjûrô V from the 11th lunar month of 1815 to the 10th lunar month of 1816. 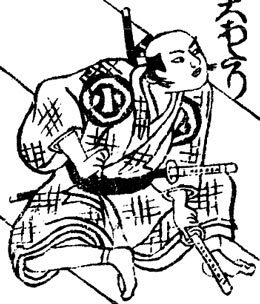 The actor Arashi Koshichi IV held the name of Arashi Sanjûrô VI from 1823 to the 2nd lunar month of 1825.